Lexii Alijai – Feel-Less [Mixtape]. 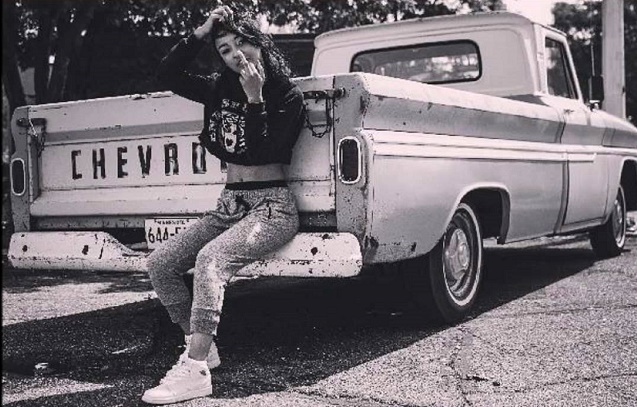 The city of Minneapolis continues to put its state on the map as 1123 Music Group artist Lexii Alijai follows up her previously released projects – In The Meantime & 3 Days EP with Rocky Diamonds – with feel∙less. Across 11 new tracks, the teenage female emcee great complex with her wordplay and an unbelievable amount of maturity in her content to be just 16 years old. Feel∙Less features contributions from Lexii’s fellow 1123 Music Group artist Rocky Diamonds, and the late-great Fly Henderson as well as production from Ryu, Static Beatz, Wisdomatic, and more. Take a listen to Lexii Alijai’s feel∙less project. Minnesota’s Lexii Alijai dropped off her new mixtape today titled “feel∙less” and you would never guess that she’s only 16. The rapper shows an undeniable amount of maturity in her bars and complex wordplay. Alijai raps about unrequited love without using any lyrical gimmicks to get her point across that she’s not a fan of feelings. (hence the feel∙less) Alijai also gets personal and raps about getting taken away from her mother and her upbringing on “No Cry” ft. Ashley Dubose. Minnesota continues to make noise as of late! With talented individuals such as Nikko Lafre, Spooky Black and Allan Kingdom making a name for themselves the scene is wide open. Today Lexii Alijai delivers a mixtape filled with powerful verses and a sound you probably wouldn’t expect from a 16 year old.